Mark Justin Dantonio (born March 9, 1956) is an American football coach and former player. He is the current head football coach at Michigan State University and he has held the position since the 2007 season, presiding over one of the most successful eras in the program's history. He's led the Michigan State Spartans to three Big Ten Conference championships, and eight victories over archrival Michigan in twelve years. In 2013, he coached Michigan State to its first 13-win season and the program's fifth trip to the Rose Bowl, where they defeated Stanford and finished the season ranked No. 3 in the nation. At the time, this was only the second instance a Big Ten team had reached the 13-win mark, the other being Ohio State's national championship season in 2002, where Dantonio was the defensive coordinator.The 2013 season also marked the first time a Big Ten team won nine conference games by double digits in each contest. In 2015, Dantonio became the first head coach in Big Ten history to achieve at least 11 wins in five of six seasons. On December 6, 2015, Dantonio's Spartans qualified for the College Football Playoff for the first time in the program's history. The Spartans were the No. 3 seed in the Playoff and faced Alabama in the 2015 Cotton Bowl, but lost 38–0. In 2006, Dantonio was hired as the Spartans head coach, returning to the school where he served six years as an assistant coach under Nick Saban and Bobby Williams. Known as a defensive-minded coach, Dantonio has compiled a 107–51 record at Michigan State, giving him a .691 winning percentage, the highest of any Michigan State football coach since Clarence Munn, who coached the Spartans from 1947 to 1953. During his tenure, the Spartans have won the school's first bowl game since 2001 in the 2012 Outback Bowl and the school's first Rose Bowl since 1988 in 2014. Dantonio's Spartans hold active school record with four consecutive bowl wins. On October 8, 2011, Dantonio signed a contract extension that made him a "Spartan for life." In 2014, he earned the second highest salary among college football coaches, due largely to a retention bonus. Dantonio was born in El Paso, Texas, to Justin and Maryan. Mark is of Italian descent. Dantonio's Grandfather Frank D'antonio moved from Montenerodomo, Italy, to the United States - losing the apostrophe at Ellis Island – in 1912. Mark was the second of four boys. When Mark was one, the family moved to Zanesville, Ohio, where Justin became the vice principal and basketball coach at Zanesville High School. Mark was an all-state safety at Zanesville. Dantonio attended the University of South Carolina and earned three letters as a defensive back for Coach Jim Carlen for the Gamecocks 1976-78. He earned a bachelor's degree in education from South Carolina in 1979. Dantonio later earned a master's degree in education from Ohio University in 1980. Dantonio began his coaching career at Ohio University, where he was a graduate assistant. In 1981, he made his first stop in the Big Ten Conference when he moved on to Purdue University as a graduate assistant. He spent two years, in 1983 and 1984, as a graduate assistant at Ohio State University under head coach Earle Bruce. In 1986, he began a five-year stint on Jim Tressel's staff at Youngstown State University as a defensive secondary coach. In 1990, Dantonio led the Penguins' defense to an 11–0 record and a #2 ranking nationally. Glen Mason hired Dantonio in 1991 to be the defensive secondary coach for the Kansas Jayhawks. When Nick Saban was hired at Michigan State in 1995, he hired Dantonio to join his staff in East Lansing where he remained even after Saban left for LSU. After Bobby Williams was named head coach in 1999 following Saban's departure, Dantonio was promoted to associate head coach where he remained through the 2000 season. At Ohio State in 2001, Dantonio reunited with his former Youngstown State boss and good friend Jim Tressel when he opted out of East Lansing to serve as defensive coordinator at Ohio State University for three seasons. His defense became known as one of the stingiest in the country. During the Buckeyes' 2002 National Championship season, Ohio State ranked second nationally in scoring defense and third in rushing defense. For his efforts, Dantonio was named a 2002 finalist for the Broyles Award, given annually to the nation's top college football assistant coach. In the 2003 season, his defense ranked number one in the country in rushing defense and ninth in total defense, which led the Buckeyes to an 11–2 record and #4 national ranking. Six Buckeye defenders were named first team All-Big Ten during Dantonio's tenure. Thirteen were drafted into the NFL, including two first round picks in Chris Gamble and Will Smith. Dantonio was named head coach at Cincinnati on December 23, 2003. He became the first head coach in 23 years to lead the school to a winning season in his first season at UC. The Bearcats' 7–5 record included a 5–3 record in Conference USA, which was good enough for a second-place finish. The Bearcats finished the season on a winning note with a 32–14 win over Marshall in the PlainsCapital Fort Worth Bowl. During Dantonio's time at UC, he led the Bearcats to a bowl game victory and directed the team's transition into the Big East Conference. As head coach, Dantonio had 15 players earn all-conference honors and 25 received conference academic recognition. Mark Dantonio became the 24th head coach at Michigan State on November 27, 2006. Upon his arrival, Dantonio planned to return the Spartans to a more traditional philosophy on offense and defense, eliminating the spread offense and the "bandit" linebacker/safety position used under previous head coach John L. Smith. Dantonio began his Michigan State career well at Spartan Stadium when on April 21, 2007, Michigan State drew over 25,000 fans to watch the team's spring scrimmage game. The white team, led by sophomore quarterback Connor Dixon, defeated junior quarterback Brian Hoyer and the green team by a score of 21–8. During the game, Dantonio was seen behind the line of scrimmage watching and coaching the action. Dantonio won his first game at Michigan State on September 1, 2007, when the Spartans defeated the UAB Blazers, 55–18. His first season at Michigan State was the school's most successful since 2003. Dantonio's Spartans went 7–5, losing all five games by seven points or fewer, and were bowl eligible for the first time in four years. However, the Spartans lost to Boston College in the Champs Sports Bowl in Orlando on December 28. Dantonio's second season at MSU began with a loss at Cal, after which the Spartans came home and won six straight games against Eastern Michigan, Florida Atlantic, Notre Dame, Indiana, Iowa, and Northwestern. The victories propelled Michigan State into the top 25. Following a lopsided 45–7 loss to the Ohio State Buckeyes, the Spartans beat Michigan, 35–21, in Ann Arbor for the first time since 1990. Michigan State won its final two home games against Wisconsin and Purdue before losing to Penn State in Happy Valley. A win against Penn State would have resulted in Michigan State splitting the Big Ten Conference title with Ohio State. The nine regular season wins were Michigan State's most since 1999. Michigan State finished third in the conference and was invited to play Georgia in the Capital One Bowl. Michigan State lost the game, 24–12, finishing the season 9–4. Dantonio's third season, 2009, was disappointing in performance and off-the-field issues. The team lost five games (Central Michigan, at Notre Dame, Iowa, at Minnesota, Texas Tech) in which they held the lead in the fourth quarter, leading to a disappointing 6–7 record. On September 19, 2010, just hours after a stunning fake field goal touchdown pass gave MSU a 34–31 overtime victory over Notre Dame, Dantonio checked himself into a hospital after noticing chest pains. He later suffered a heart attack. He had a stent implanted in a blocked artery near his heart. His doctor stated that the damage was minimal and that Dantonio was expected to make a full recovery. Offensive coordinator Don Treadwell became acting head coach while Dantonio recovered. On September 30, after Dantonio had stated that he would be coaching the next game from the press box and just two days before Michigan State played Wisconsin, Dantonio was admitted back into the hospital as a blood clot was found in his leg. Dantonio had to watch the game from his hospital room. He was reportedly released from Sparrow Hospital around noon on October 4, 2010. On October 9, Dantonio coached his first game since his heart attack against rival Michigan. Michigan State won the game, 34–17, in Ann Arbor. The Spartans under Dantonio continued to win and on November 20 reached 10–1 on the season, winning all home games for the first time during his tenure. It was just the third time in school history that Michigan State had won 10 or more games in a season, the other two seasons being those of 1965 and 1999. 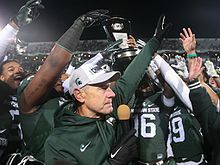 On November 27, 2010, Dantonio's Spartans defeated Penn State 28–22 in Happy Valley to finish the season 11–1 and clinch a share of the Big Ten Championship for the first time since 1990. On December 5, 2010, MSU announced that the Spartans were selected to play in the Capital One Bowl on January 1, 2011, against Alabama (ranked 15th in the BCS standings). The Spartans lost to the Crimson Tide 49–7 and finished 11–2. In 2011, Michigan State had another successful year. The Spartans beat the Ohio State Buckeyes on the road for the first time since 1998, defeated arch-rival Michigan, and upset #6 Wisconsin on a last-second Hail Mary pass from Kirk Cousins to Keith Nichol. The Spartans finished 10–2 (7–1 in Big Ten play), earning the Legends Division championship and a place in the inaugural Big Ten Championship Game. After coming up just short in a rematch with Wisconsin, MSU was selected to play in the Outback Bowl against the Georgia Bulldogs. Dantonio led his team to a triple-overtime victory, his first bowl win at MSU. The Spartans reached the 11-win mark for the second straight season, finishing 11–3. In 2012, Dantonio led the Spartans to a 7–6 record and a Buffalo Wild Wings Bowl win against Texas Christian University. The season started with promise, when preseason #13 Michigan State beat #24 Boise State; but two games later, the #10 Spartans lost to No. 20 Notre Dame, and went on to suffer four home losses in Big Ten play. The defense finished ninth in FBS points allowed, giving up just 16.3 points per game, but the offense struggled to score in several games. MSU lost a 12–10 decision to Michigan, despite the defense keeping the Wolverines out of the end zone the entire game. In May 2013, four months after the end of the 2012 season, Dantonio filmed himself at the Rose Bowl, predicting a successful 2013. In 2013, Dantonio's team finished 11–1 in the regular season, including notable victories over Michigan (29–6) and Nebraska (41–28) to secure the third and final Legends Division title. On December 7, 2013, Michigan State, ranked #10 at the time of the game, defeated second-ranked Ohio State 34–24 in the Big Ten Championship Game in Indianapolis. The win snapped Ohio State's 24-game winning streak and sent Michigan State to its first Rose Bowl since the 1987–88 season. Michigan State was ranked #4 in the final BCS standings, its highest rank since the BCS's inception. The Spartans defeated the fifth-ranked Stanford Cardinal 24–20 in the 100th Rose Bowl Game on January 1, 2014. Dantonio was named Big Ten Football Coach of the Year. In 2014, the Spartans finished the regular season 10–2, finishing second in the East division with a 7–1 record and ranked #8 in the nation. After losing to third-ranked Oregon in the season's second game, the Spartans reeled off nine wins in their next 10 games. The Spartans earned a bid to the Goodyear Cotton Bowl Classic, part of the New Year's Six bowls, and rallied from 20 points down in the fourth quarter to defeat fifth-ranked Baylor 42–41 and finish the season with an overall record of 11–2. The two losses came against Oregon and Ohio State, the teams that would play in the 2015 College Football Playoff National Championship. After the Cotton Bowl game, Dantonio said "It's a feeling of belief in each other, and that's what we have. We don't give up on each other. Consequently, they don't give up in the game. We just keep playing hard. And that's what we've been able to accomplish." The 2015 season included an unlikely road win against then-#2 Ohio State, in which the Spartans played without starting quarterback Connor Cook. MSU also defeated Oregon, Penn State and Michigan to finish the regular season with an 11–1 record, winning the East division with a 7–1 record. Michigan State went on to beat an undefeated Iowa team in the Big Ten Championship Game, and ended the season ranked #3 in the nation. The #3 ranking earned the Spartans a spot in the NCAA College Football Playoff and the right to play #2 ranked Alabama on New Year's Eve for a spot in the Championship game. They lost to eventual National Champion Alabama in the semi-final game, 38–0. In 2016, the Spartans had their worst season under Dantonio, going 1–8 in Big Ten play and finishing the season at 3–9, the program's worst overall record in more than 30 years. Michigan State ended the regular season 9–3. The 2018 season featured upset wins over then-#7 Penn State at home and then-#7 Michigan on the road. Dantonio moved to 8–3 all-time against in-state rival Michigan, as the Spartans forced five turnovers and defeated the Wolverines 14–10 in Ann Arbor. They finished the regular season at #16 in the CFP rankings and second in the B1G East Division (7–2). The Spartans were selected to play the 9–3 Washington State Cougars in the Holiday Bowl on December 28. The Spartans routed the Cougars, 42–17, to finish the season 10–3, giving Dantonio his sixth season of 10+ wins at MSU. Michigan State started the season ranked #11 in the AP Top 25 Poll. They avoided an upset by unranked Utah State in the first game of the season, needing a late interception from junior linebacker Joe Bachie to preserve a 38–31 victory. In the Spartan's second game of the season they would fall to Arizona State 16-13. Falling back in the polls Michigan State would then defeat Indiana 35-21. The following week Dantonio's team beat Central Michigan 31-20 in their last non-conference game of the season. Michigan State would be upset at home by Northwestern 29-19 the following week sending them out of the AP top 25. The following week the Spartans traveled to at top 10 team in Penn State, despite being heavy underdogs Michigan St would stun Penn State with a last second touchdown pass to win 21-17. On October 20 Michigan State hosted Michigan, Michigan's defense overpowered Michigan State 21-7. The following week, the Spartans would go on the beat Purdue by a score of 23-13. MSU would then travel to Maryland and dominated the Terps 27-3. After the win, MSU would come home and lose to Ohio State, 26-6, and then travel to Lincoln and lose to Nebraska, 9-6. In the final game of the season, the Spartans would narrowly defeat Rutgers by a score of 14-10. MSU would finish the season 7-5. Mark Dantonio married his wife, Becky, in 1990. The couple have two daughters, Kristen and Lauren. He is a devout Roman Catholic. ^ a b Rexrode, Joe (December 8, 2013). "The Detroit Free Press". Detroit, Michigan: The Detroit Free Press. p. D1. ^ "spartansgameday.com". Retrieved 8 October 2017. ^ "Michigan State Spartans Coaches - College Football at Sports-Reference.com". College Football at Sports-Reference.com. Retrieved 8 October 2017. ^ "New Dantonio deal makes him 'Spartan for life'". Retrieved 8 October 2017. ^ "Report: MSU's Dantonio trails only Saban in earnings". Retrieved 8 October 2017. ^ a b "How faith, hard work brought Mark Dantonio to Rose Bowl". Retrieved 8 October 2017. ^ Press Conference. "Big Ten Champions Accept Invitation from Capital One Bowl" "Michigan State Spartans" East Lansing, 5 December 2010. Retrieved 2010-12-5. ^ "2012 Michigan State Spartans Schedule and Results - College Football at Sports-Reference.com". College Football at Sports-Reference.com. Retrieved 8 October 2017. ^ "Michigan first to 900 wins after late field goal seals game". espn.com. October 20, 2012. Retrieved August 22, 2017. ^ "Michigan State's Mark Dantonio prerecorded prediction from Rose Bowl in May: 'It will be our time'". Retrieved 8 October 2017. ^ a b "NCAA FBS (Division I-A) Football Standings". ESPN.com. Retrieved 8 October 2017. ^ "Michigan State Spartans College Football - Michigan State News, Scores, Stats, Rumors & More - ESPN". Retrieved 8 October 2017. ^ "Post-Game Quotes: Cotton Bowl Classic". Retrieved 8 October 2017. ^ "2017 NCAA College Football Polls and Rankings for Week 6 - ESPN". ESPN.com. Retrieved 8 October 2017. ^ "Michigan State 2016 Schedule - Spartans Home and Away - ESPN". ESPN.com. Retrieved 8 October 2017. ^ Needelman, Joshua (December 3, 2017). "Michigan State players frustrated by Holiday Bowl placement". LandOf10.com. Retrieved December 7, 2017. ^ Dienhart, Tom (December 29, 2017). "Best of 2017 Holiday Bowl: No. 16 Michigan State routs No. 18 Washington State, 42-17". BTN.com. Retrieved January 5, 2018. ^ a b c "MSUSPARTANS.COM :: Mark Dantonio Bio :: Michigan State University Official Athletic Site Michigan State University Official Athletic Site :: Football". Retrieved 8 October 2017. ^ "University of Cincinnati Official Athletic Site". www.gobearcats.com. Retrieved 8 October 2017. ^ "Coach's game plan is X's, O's of life: Terry Pluto". Retrieved 8 October 2017. ^ "Link to Jim Tressel means Michigan State's Mark Dantonio not a good fit at Ohio State". Retrieved 8 October 2017. ^ "As more coaching jobs open, KU's search continues". KUsports.com. Retrieved 8 October 2017. ^ "Spartans' Mark Dantonio remains appreciative of Alabama's Nick Saban giving him a chance". Retrieved 8 October 2017. ^ "Dan Enos brings struggling Central Michigan University program to face Michigan State and mentor Mark Dantonio". Retrieved 8 October 2017. ^ "Pitt makes it official: Pat Narduzzi named head football coach". Retrieved 8 October 2017. ^ "Don Treadwell Named Head Football Coach at Miami". Retrieved 8 October 2017.